← Primeira morte de policial UPP: história complicada para desvendar? For an update, check here. Ask a question and you get an answer. Ask someone else the same question and you’ll get another one. Sometimes the two answers seem to make a perfect match. And yet all must be investigated and proven. The Disque Denúncia hotline has received many calls and today saw three arrests related to last night’s attack on pacification police in the Complexo do Alemão favelas. 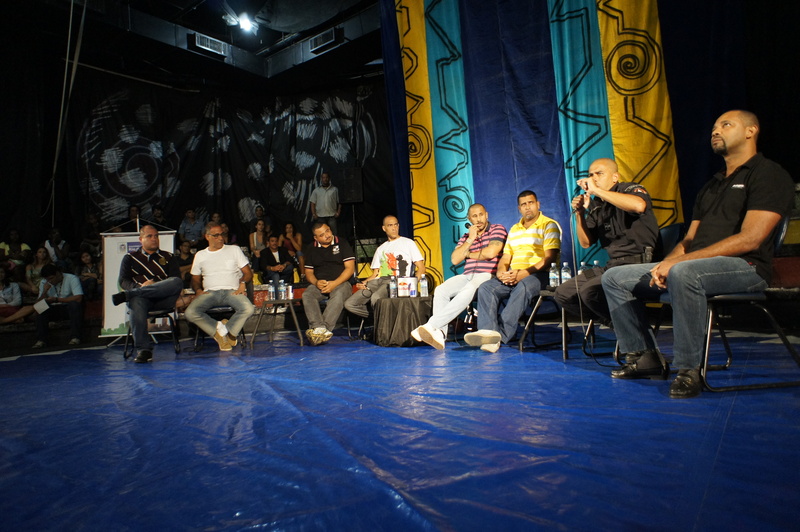 Meanwhile, an historic event took place this afternoon at Afroreggae’s Cantagalo unit: a sort of talk-show with former drug traffickers, a former militia member and police, hosted by the NGO’s founder, José Junior. It happened that the elevator that connects Ipanema’s Rua Alberto de Campos to the “Brizolão” wasn’t working. And it happened that some Afroreggae employees were there, also trying to decide if it was better to climb 25 flights of stairs, or go around the block and take the elevator up from the General Osório metrô station, to then cross part of the Pavão-Pavãozinho favela and so arrive at the Afroreggae auditorium. “What happened last night in Alemão?” RioRealblog asked one of them. Shots fired at the pacification police unit’s building, one of which got through a bullet-proof vest worn by soldier Fabiana Aparecida de Souza, killing her, reportedly came from different directions. 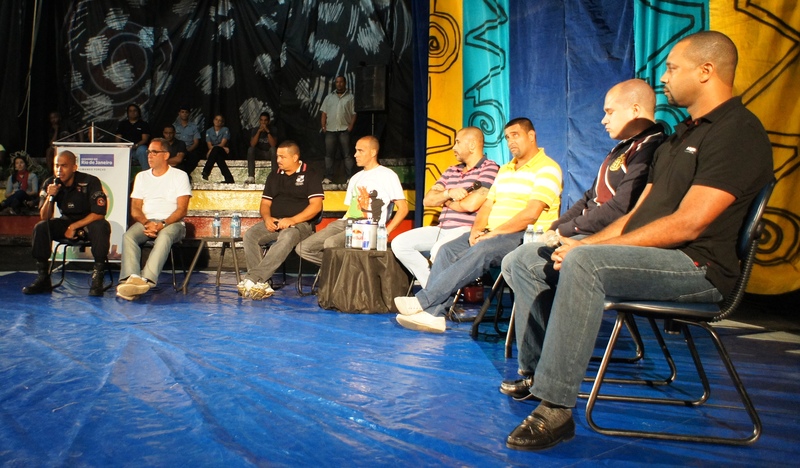 On July 12, the Centro de Estudos de Segurança e Cidadania made public the results of a second public opinion survey carried out among pacification police. The numbers show that many police don’t consider themselves well prepared for their work: in 2010, 63% considered themselves adequately prepared to work in pacification units. Two years later, this number dropped to 49%. The universe researched in the two surveys changed a great deal, since the number of pacification units has grown. The first survey heard 359 police and the second, 775. In the last two years, the portion of police with a university degree climbed from 37% to 47%; and the proportion of women in the force grew from 0,8% to 11%. These changes may help explain the drop in self-evaluation regarding preparation. Possibly, the study’s most important finding may arise from the quantification it makes of the “level of commitment to the project” of pacification that the police revealed, by way of their answers to five questions. A total of 51,% were categorized as “neutral or ambiguous” about the project. An additional 15,5% were partially or totally resistant. Thus, only a third identified with the goals of pacification, partially, or totally. The respondents in 2012 are happier with their work conditions than those in 2010. These conditions don’t include personal safety, though many said that one attractive aspect of pacification work is that it’s safer than other police work. However, of the police surveyed this year, 60% would like to leave pacification. For an impressive array of qualitative information on how UPP police operate and see themselves and favela residents, see this new study (starting on page 136), soon to be summarized in a new post. What’s clear from the results of the CESeC survey is that the idea of community policing is still weak among pacification police. Only 5% said they meet often with favela residents, since this is more the task of their commanders. The current 24 police pacification units of Rio de Janeiro employ 5,500 police. They have had from six to seven months training, together with the traditional military (non-UPP) police, with very little time spent on community policing. Since last year, top members of the military police force are working to effect a revolution in the police academy curriculum. It’s not clear what kind of training could prevent pacification police from committing kidnappings, if this is what did occur. During the Afroreggae event, civil police inspector José Magalhães, who works with the NGO, commented on yesterday’s attack on the Alemão police pacificatin unit. “Something abnormal happened, which will soon come to light,” he said. This entry was posted in Brasil, Transformation of Rio de Janeiro / Transformação do Rio de Janeiro and tagged AfroReggae, attack complexo do alemão UPP, Comandos Cantagalo, Favela Nova Brasília, pacification police corruption, police pacification rio de janeiro, UPP soldier killed. Bookmark the permalink. 1 Response to First pacification police death: complicated story yet to be revealed?